A motto for Big Walnut Local Schools is to “Inspire & Guide,” and over the course of the school year, each building has activities where students showcase what they’ve learned. In addition, they can also learn about other educational opportunities and future careers. Interestingly, it’s a topic that’s discussed by the district’s administration and the board of education — whether a student should have a career path chosen by the time they graduate from Big Walnut High School. While there is no consensus, the district does try to inspire students and parents, along with guiding them to make informed choices. For example, on a snowy night last month, there were two such events. First, Big Walnut Middle School held its inaugural Student Showcase. At the open house, families had the opportunity to see what their seventh- and eighth-graders are doing at the middle school, hear a presentation on College Credit Plus, and find out what summer educational and athletic activities are available. Exhibitors said they were getting interest from potential participants. However, the busiest spot in the BWMS commons was a blocked-off section where students with joysticks controlled motorized robots. These robots, custom-built and programmed by students in the STEAM (Science Technology Engineering Arts Mathematics) classes, could be controlled to pick up and stack yellow cones. Eckelbarger said his students learn coding, video editing and projects like building a micro-controller for the school’s greenhouse. He said Principal Josh Frame was a big supporter of the STEAM curriculum. Eckelbarger added his classes are very popular, and the students say they don’t feel like they’re in a classroom. 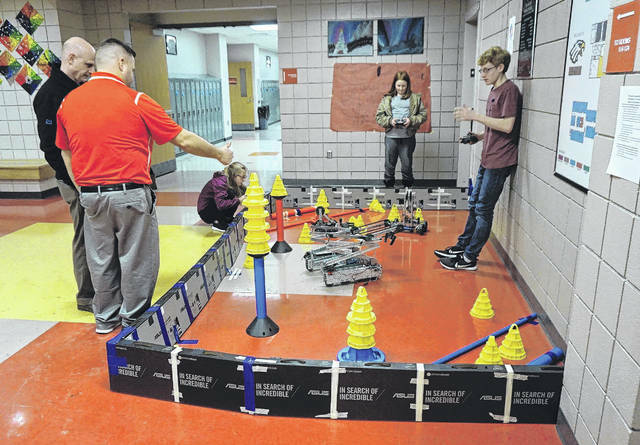 One of Eckelbarger’s students — eighth-grader Ryan Grudell — was guiding his robot to stack as many cones as possible. Grudell said he was training for a robotics competition in Lorain, that STEAM was his favorite class, and he’s interested in working in the field. Just down the road in Sunbury, there was a Science Fair at Big Walnut High School. The cafeteria and lobby areas were filled with students and their experiments. Among the many experiments was what type of beverage was best at promoting tooth decay (answer: colas). 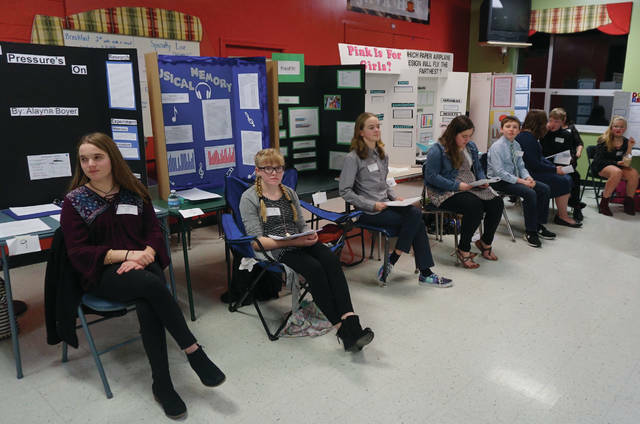 Judges (54 total) wandered to each display asking students questions about their experiment. At the end of the evening, prizes were awarded to the top displays, qualifying the students for a higher-round contest. The high school was also recently the site for an “Educational Options” night, a FFA week, an eighth-grade orientation, and a first-ever career fair for juniors that Principal Andy Jados said featured 28 speakers and had appointments with school counselors regarding future plans. On Feb. 27, juniors took the ACT test at St. John Neumann Catholic Church. Recently, students interested in architecture, civil engineering, construction management and Geographic Information Systems got to learn more about programs at the Delaware Area Career Center and Columbus State Community College’s Delaware Campus. On Monday at the middle school, representatives from the Ohio Department of Job and Family Services showed students the tools available to them on the OhioMeansJobs.com website.